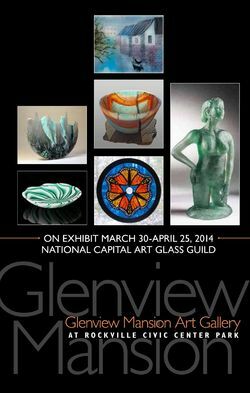 The NCAGG art glass exhibition titled "Secret Life of Glass" opens March 30th, 2014 at the Glenview Mansion Art Gallery, located in the Rockville, MD. This juried exhibition explores the many creative and technical secrets of glassmaking via the 120-plus original works of art. Three of my stained glass pieces will appear in this exhibit. I am honored to have my Fabio the Bird to be displayed alongside such distinguished works of art! Fabio the glass bird has sold at the show - it flew off to a loving home!